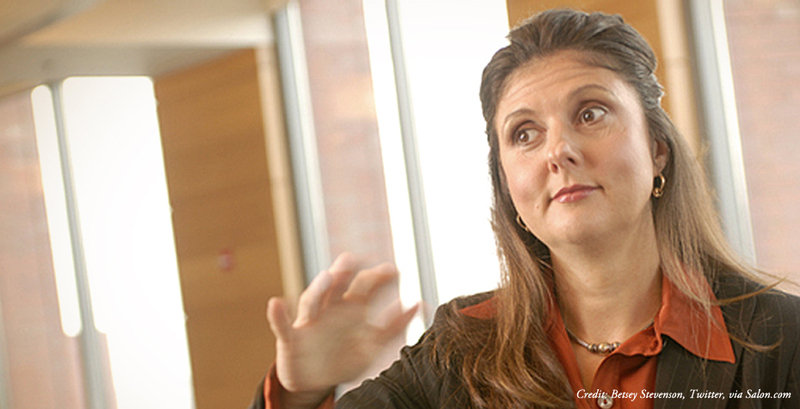 Last week, President Obama announced the appointment of Betsey Stevenson '93 to his Council of Economic Advisers. Stevenson, who is currently an economist at the University of Michigan, is perhaps best known for her work on the impact of public policy on labor markets, marriage and divorce, women and families, and happiness and well-being. She served as chief economist at the Department of Labor from 2010 to 2011. According to a White House blog post, Stevenson is an expert on all aspects of how the labor market works—how people search for jobs, how people obtain jobs, and how employers identify qualified candidates. For example, she has found that the Internet is actually used most by those who are already employed. While serving as the Labor Department's chief economist, she worked on ways to reform unemployment insurance laws to expand work-sharing and self-employment assistance. The Council of Economic Advisers is responsible for advising the president on issues related to economic policy. They also work to present potential solutions. Stevenson will work alongside a chairman and one other member to shape economic policies for the coming year. Currently, Stevenson is an associate professor of public policy at the Gerald R. Ford School of Public Policy at the University of Michigan. She has held professorships at Princeton and The Wharton School at the University of Pennsylvania, and also worked for the Federal Reserve, among other positions. Stevenson studied economics and mathematics while at Wellesley, then attended Harvard University where she received an M.A. and Ph.D. in economics.